The Eighth Cornwall International Male Choral Festival is now over and was probably one of the best Festivals since it began in 2003. Having now held two choir practices at Paul Church, disbelief and amazement still hang over West Cornwall ten days after the final concert. It has still not sunk in that Mousehole MVC achieved such a remarkable result. For the record, the Choir competed in the ‘41 Voices and Over Category’. This was the first time that the choir had entered this major competition. Competition was the word, with seven other choirs from Cornwall the UK and Europe competing for very prestigious trophies. The choir entered the competition with three pieces of music: ‘Four Strong Winds’ by Ian Tyson, arr. Larry Nickel; ‘Sing Your Way Home’ Words Anon, music by Joseph M Martin and the traditional spiritual, ‘Battle of Jericho’ arranged by Mark Hayes. Competing in eighth place gave some choir members time to listen to some of the other performers. They reported back to the choir and said how impressive the other choirs were. In the warm up room Steve Lawry prepared the choir with a warm up, singing one verse of ‘Calm As The Sea’ and a joke, laughter and song filled the air. The choir were as prepared as they could be. Competing came and went in a blur and then it was the long wait for the adjudication. The day so far had run with clockwork precision but now there were delays. Finally back came the adjudicators, Hans Lundgren (Chair), Trevor Hughes and Christopher Gray (Director of Music at Truro Cathedral). The results were read out, not in descending order but in the order the choirs had competed. For Mousehole the wait was agonising, quiet descended on the Hall until the choirs worked out who had won and then it erupted in a cacophony of sound. It was still not clear where each choir was placed, until Mousehole were called up to receive the rewards with third place. 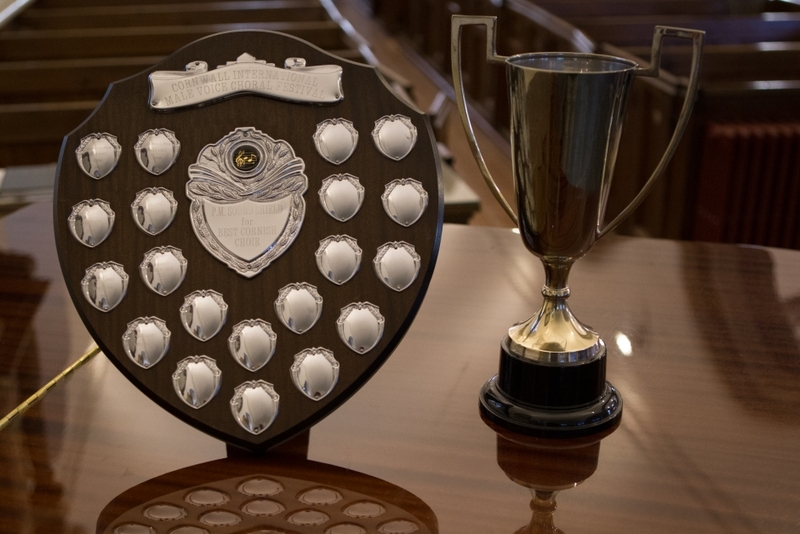 The accolades didn’t stop there, with the choir receiving the Pendennis Trophy for best Cornish Choir in class and the overall trophy, the PM Shield for best Cornish Choir in the festival. Stunning as this was, Mousehole had achieved third place with only one point separating them from Fron Male Voice Choir (85 marks) in first place - Yes that Fron Choir which received the recording contract a few years ago! The judges awarded the choir an overall mark of 84. In the adjudicator’s remarks they felt that “Four Strong Winds” was suited to the choir very well. They said that “diction was exceptionally clear and tuning was largely impressive”. The adjudicators then described the choir’s rendition of "Sing Your Way Home” as “Having a magic about the singing and a lovely vocal tone”. They also “were transfixed and just wanted to listen and enjoy this piece”. They saved their best praise for “Battle of Jericho”, which they described as “A good piece to close the competition! Technically secure and performed with flair”. The judges also thought that the singing “was very disciplined and conducted very well (with) nicely graded dynamics”. Our thanks must go to our musical team of Annette Turton, and David Williams, led by Steve Lawry who have done us proud, bringing the choir up to competition standard with a laugh, no pressure and a real feeling of self belief.